My family and I have been enjoying the hobby of metal detecting for many years. Over that time we’ve seen the machines advance greatly. With all the new developments though, one thing has remained the same; you need to choose a metal detector based on what type of treasures you hope to find and the ground conditions you think you’ll experience the most. For the majority of us who only have one machine, that unfortunately means that some type of treasure hunting is likely to be either difficult or impossible. Thankfully, the XP DEUS Metal Detector came along and made this issue a thing of the past. Rather than purchasing 4 separate metal detectors, the XP DEUS combines the capabilities of a coin and jewelry, gold prospecting, relic hunting, and beach detecting metal detector into one machine to open up a whole new world of treasure hunting possibilities. The DEUS operates at 4 distinct user selectable frequencies. Simply choose the best frequency for the targets that you are searching for. A high frequency is best for gold prospecting whereas a lower frequency is ideal for locating coins and relics. In addition to the 4 frequencies, the DEUS has the fastest target recovery speed available. Simply put, this detector will locate good targets on top of junk that no other detector can! Using the XP DEUS for coin and jewelry hunting has been ideal because it’s allowed me to separate trash from treasures exceptionally well — which is very important when the targets are small. This unique ability not only saves time and energy digging up pull tabs and other questionable targets, but it’s helped me find treasures laying on top of trash which hasn’t been my experience with any other machine I’ve used. Gold prospecting with a metal detector is something I, and a lot of other metal detectorists, have a lot of fun and success doing — but even moreso since I’ve been using the XP DEUS. With the unique Gold Field Program, the XP DEUS is given the ability to find small gold nuggets buried deeply in the ground that other metal detectors would classify as trash or not even find. Relic hunting is a term used to describe a variety of types of metal detecting finds but is most commonly used to describe antique military targets like bullets, buttons, and bayonets. As you might imagine, the old battlefields that hold treasures like these are often quite picked over. However, I recently took my DEUS to my favorite relic hunting spot and found several new items! It’s not just me either, XP is getting a lot of feedback like this which is very exciting for collectors, history buffs, and metal detectorists alike. Metal detecting at the beach is notoriously difficult because of the mineralized ground conditions created by the salt water that makes chatter and false signals in the metal detector. At the same time, the beach is also the perfect spot to go metal detecting because so much gets lost there. While there are some excellent metal detectors available that can make beach detecting easy, the XP DEUS is the first one I’ve used that can do so many other things in addition to tackling the mineralized ground conditions; and it does it all while maintaining its deep seeking capabilities too which is a rarity among metal detectors. In addition to being essentially 4 metal detectors rolled into one, the XP DEUS is also the first wireless metal detector — ever. Its search coil, headphones and LCD Display Remote all communicate wirelessly to provide a clear signal (with limited power consumption) all on a lightweight, easy to assemble/disassemble machine with no wires to get tangled, or cut. The way the DEUS is designed also allows for 4 separate configurations of the machine so you can choose the bundle that works best for your situation and your budget. This version of the DEUS is totally controlled via the wireless headphones and is the most affordable option. Although the headphones are wired this configuration also is the lowest priced option that includes the wireless remote. This configuration of the DEUS includes the wireless backphone headphones and the wireless remote. Full sized wireless headphones plus fully equipped LCD wireless remote makes this the ultimate version of the DEUS available. XP also designed the DEUS to be upgradable for life. So instead of buying a new metal detector each time new capabilities are released, you can simply get out the USB cable, plug one end into the display screen, the other into your computer, and your machine will upgrade on its own. The most surprising thing for me though is how many targets of all kinds the DEUS found that my other machines would miss. Basically, the XP DEUS is able to locate good targets on top of junk that no other machine can. 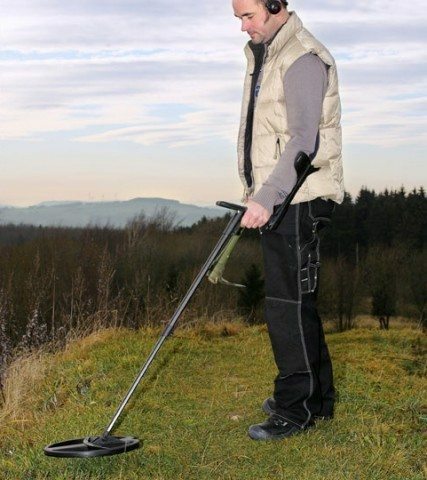 The XP DEUS metal detector is clearly the most advanced detector on the market today. While it carries a higher price tag than many hobby metal detectors, the turn on and go simplicity and extra finds are impressive. As someone who has been metal detecting for a long time, I can tell you that this is a machine that really advances the field and opens up a whole new level of metal detecting to us all. I’m excited to use this machine personally, and to recommend it to other metal detectorists as well. Our guest contributor, Michael Bernzweig, manages MetalDetector.com in Southborough, MA. He has written on the subject of treasure hunting and metal detecting since the mid 1980’s. He enjoys traveling with his metal detector and helping to educate others in the correct use of metal detectors in their explorations.